Thrombin is a serine protease with multiple cellular functions that acts through protease activated receptor kinases (PARs) and responds to trauma at the endothelial cells of vein resulting in coagulation. In this study, we had analyzed the activity of thrombin on the vein by using human umbilical vein endothelial (HUVEC) and human aorta smooth muscle (AoSMC) cells. Ectopic thrombin increases the expression of PARs, cAMP concentration, and Gi signaling as a result the proliferation events in the smooth muscle cells achieved by the elevation of activated ERK leading to gene activation through c-AMP binding elements responsive transcription factors such as CREB, NFkB50, c-fos, ATF-2. We had observed activation of p38 as well as JNK but they were related to stress and inflammation. In the nucleus, ATF-2 activity is the start point of IL-2 proliferation through T cell activation creating APC and B-cell memory leading to autoimmune reaction as a result of ectopic thrombin. These changes in the gene activation increased connective tissue growth factor as well as cysteine rich protein expression at the mRNA level, which proven to involve in vascularization and angiogenesis in several studies. Consequently, when ectopic thrombin used during the graft transplant surgeries, it causes occlusion of the veins so that transplant needs to be replaced within six months due to thrombin’s proliferative function as mitogen in the smooth muscle cells. 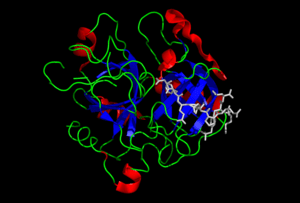 Thrombin is a multifunctional serine protease that plays a major role in the highly regulated series of biochemical reactions leading to the formation of fibrin (1, 2). Thrombin has been shown to affect a vast number of cell types, including platelets, endothelial cells, smooth muscle cells, cardiomyocytes, fibroblasts, mast cells, neurons, keratinocytes, monocytes, macrophages and a variety of lymphocytes, including B-cells and T-cells, and stimulate smooth muscle and endothelial cell proliferation (3-13). Induction of thrombin results in cells response as immune response and proliferation by affecting transcriptional control of gene expression through series of signaling mechanisms (14). First, protease activated receptor kinases (PAR), which are seven membrane spanning receptors called G protein coupled receptors (GPCR) are initiate the line of mechanism by thrombin resulting in variety of cellular responses. These receptorsare activated by a unique mechanism in which the protease createsa new extracellular amino-terminus functioning as a tetheredligand, results in intermolecular activation. PARs are ‘single-use’ receptors: activation is irreversible and the cleaved receptors are degraded in lysosomes, as they play important roles in ’emergency situations’, such as trauma and inflammation. Protease activated receptor 1 (PAR1) is the prototype of this family and is activated when thrombin cleaves its amino-terminal extracellular domain. PAR1, PAR3, and PAR4 are activated by thrombin. Whereas PAR2 is activated by trypsin, factor VIIa, tissue factor, factor Xa, thrombin cleaved PAR1. Second, the activated PAR by the thrombin stimulates downstream signaling events by G protein dependent or independent pathways. Although each of the PAR respond to thrombin undoubtedly mediates different thrombin responses, most of what is known about thrombin signaling downstream of the receptors themselves has derived from studies of PAR1. PAR couples with at least three G protein families Gq, Gi, and G12/13. With G protein activation: Gi/q leads InsP3 induced Ca release and/or Rac induced membrane ruffling. Gi dependent signaling activates Ras, p42/44, Src/Fak, p42. Rho related proteins and phospholipase C results in mitogenesis and actin cytoskeletal rearrangements. G protein independent activation happens either through tyrosine kinase trans-activation results in mitogenesis and stress-fibre formation, neurite retraction by Rho path, or activation of choline for Rap association with newly systhesized actin. These events are tightly regulated to support diverse cellular responses of thrombin. (15-17). Treatment of veins with topical bovine thrombin showed early occlusion of the veins result in proliferation of smooth muscle cells (18-24) due to change of gene expression transcription. The change of Ca++ and cAMP concentrations influence cAMP response element binding protein (25-30) carrying transcription factors such as CREB, ATF-2, c-jun, c-fos, c-Rel. Activation of angiogenesis and vascularization affects cysteine rich gene family (CCN) genes such as connective tissue factor (CTGF) and cysteine rich gene (Cyr61) according to performed studies and microarray analysis by (31-36). Currently the most common topical products approved by FDA are bovine originated. Although bovine thrombin is very similar to human (37, 38), it has a species specific activity, shown to cause autoimmune-response (39-42), which results in repeated surgeries (40, 43, 44), and renal failures that cost to health of individuals as well as to the economy. In this report we had evaluated the effect of topically applied bovine thrombin to human umbilical endothelial cells (HUVECs) and human aorta smooth muscle cells (AoSMCs). We had showed that use of bovine thrombin cause adverse affects on the cellular physiology of human vein towards proliferation of smooth muscle tissue. Collectively, thrombin usage should be assessed before and after surgery because it is a very potent substance. Thrombins: Bovine thrombin and human thrombin ((Haematologic Technologies Inc, VT); topical bovine thrombin (JMI, King’s Pharmaceutical, KS); topical human thrombin (Baxter, NC human thrombin sealant). Cell Culture: The pooled cells were received from Clonetics. Human endothelial cells (HUVEC) were grown in EGM-2MV bullet kit (refinements to basal medium CCMD130 and the growth factors, 5% FBS, 0.04% hydrocortisone, 2.5% hFGF, 0.1% of each VEGF, IGF-1, Ascorbic acid, hEGF, GA-1000) and human aorta smooth muscle cells (AoSMC) were grown in SmGM-2 medium (5% FBS, 0.1% Insulin, 1.25% hFGF, 0.1% GA-1000, and 0.1% hEGF). The cells were grown to confluence (2-3 days for HUVEC and 4-5 days for HOSMC) before splitted, and only used from passage 3 to 5. Before stimulating the confluent cells, they had been starved with starvation media containing 0.1% bovine serum albumin (BSA) EGM-2 or SmBM basal media. RNA isolation and RT-PCR: The total RNA was isolated by RNeasy mini kit (Qiagen, Cat#74104) fibrous animal tissue protocol. The two-step protocol had been applied to amplify cDNA by Prostar Ultra HF RT PCR kit (Stratagene Cat# 600166). At first step, cDNA from the total RNA had been synthesized. After denaturing the RNA at 65 oC for 5 min, the Pfu Turbo added at room temperature to the reaction with random primers, then incubated at 42oC for 15min for cDNA amplification. At the second step, hot start PCR reaction had been designed by use of gene specific primers for PAR1, PAR2, PAR3, and PAR4 to amplify DNA with robotic arm PCR. The reaction conditions were one cycle at 95oC for 1 min, 40 cycles for denatured at 95oC for 1 min, annealed at 50 oC 1min, amplified at 68 oC for 3min, finally one cycle of extension at 68 oC for 10 min. The cDNA products were then usedas PCR templates for the amplification of a 614 bp PAR-1 fragment(PAR-1 sense: 5′-CTGACGCTCTTCATCCCCTCCGTG, PAR-1 antisense:5′-GACAGGAACAAAGCCCGCGACTTC), a 599 bp PAR-2 fragment (PAR-2sense: 5′-GGTCTTTCTTCCGGTCGTCTACAT, PAR-2 antisense: 5′-GCAGTTATGCAGTCAGGC),a 601 bp PAR-3 fragment (PAR-3 sense: 5′-GAGTCCCTGCCCACACAGTC,PAR-3 antisense: 5′-TCGCCAAATACCCAGTTGTT), a 492 bp PAR-4 fragment(PAR-4 sense: 5′-GAGCCGAAGTCCTCAGACAA, PAR-4 antisense: 5′-AGGCCACCAAACAGAGTCCA). The PCR consistedof 25 to 40 cycles between 95°C (15 seconds) and 55°C(45 seconds). Controls included reactions without template,without reverse transcriptase, and water alone. Primers forglyceraldehydes phosphate dehydrogenase (GAPDH; sense: 5′-GACCCCTTCATTGACCTCAAC,antisense: 5′-CTTCTCCATGGTGGTGAAGA) were used as controls. Reactionproducts were resolved on a 1.2% agarose gel and visualizedusing ethidium bromide. The primers CTGF-(forward) 5′- GGAGCGAGACACCAACC -3′ and CTGF-(reverse) CCAGTCATAATCAAAGAAGCAGC ; Cyr61- (forward) GGAAGCCTTGCT CATTCTTGA and Cyr61- (reverse) TCC AAT CGT GGC TGC ATT AGT were used for RT-PCR. The conditions were hot start at 95C for 1 min, fourty cycles of denaturing for 45 sec at 95C, annealing for 45 sec at 55C and amplifying for 2min at 68C, followed by 10 minutes at 68C extension. Cell Proliferation Assay with WST-1—Cell proliferation assays were performed using the cell proliferation reagent 3-(4,5 dimethylthiazaol-2-y1)-2,5-dimethyltetrazolium bromide (WST-1, Roche Cat# 1-644-807) via indirect mechanism. This non-radioactive colorimetric assay is based on the cleavage of the tetrazolium salt WST-1 by mitocondrial dehydrogenases in viable cells forming colored reaction product. HUVECs were grown in 96 well plates (starting from 250, 500, and 1000 cells/well) for 1 day and then incubated the medium without FBS and growth factors for 24 h. The cells were then treated with WST-1 and four types of thrombins, 100 units of each BIIa, HIIa, TBIIa, and THIIa. The reaction was stopped by H2SO4 and absorbance (450 nm) of the formazan product was measured as an index of cell proliferation. The standard error of mean had been calculated. BrDu incorporation: This method being chosen to determine the cellular proliferation with a direct non-radioactive measurement of DNA synthesis based on the incorporation of the pyridine analogous 5 bromo-2’-deoxyuridine (BrDu) instead of thymidine into the DNA of proliferating cells. The antibody conjugate reacts with BrDu and with BrDu incorporated into DNA. The antibody does not cross-react with endogenous cellular components such as thymidine, uridine, or DNA. The cells were seeded, next day starved for 24h, and were stimulated at time intervals 3h, 24h, and 72h with 100 units of each BIIa, HIIa, TBIIa, and THIIa, and BrDu (Roche). Cells were fixed for 15 min with fixation-denature solution and incubated with primary antibody (anti-BrDu) prior to incubation with the secondary antibody. The cells were then fixed in 3.7% formaldehyde for 10 min at room temperature, rinsed in PBS and the chromatin was rendered accessible by a 10 min treatment with HCI (2 M), then measured the activity at A450nm. Nuclear Extract Preparation: The nuclear extracts were prepared by the protocol suggested in the ELISA inflammation kit (BD). For each treatment one 100mm plate were used per cell line. EMSA: The 96 well-plates were blocked at room temperature before incubating with the 50 ul of prepared nuclear extracts from each treated cell line were placed for one hour at 25C. The washed plates were incubated with primary antibodies of each transcription factors for another hour at 25C and repeat the wash step with transfactor/blocking buffer prior to secondary antibody addition for 30 min at 25C, wash again with transfactor buffer, which was followed by development of the blue color for ten minutes and the reaction was stopped with 1M sulfuric acid, and the absorbance readings were taking at 450nm by multiple well plate reader. Immunoblotting: The activated level of pERK, Gi, Gq, and PAR1 had been immunoblotted to observe the mitogenic effect of bovine thrombin on both HUVEC and AoSMCs. The cells were lysed in sample buffer (0.25M Tris-HCl, pH 6.8, 10% glycerol, 5%SDS, 5% b-mercaptoethanol, 0.02%bromophenol blue). The samples were run on the 16% SDS-PAGE for 1 hour at 30mA per gel. Following the completion of transfer onto 0.45micro molar nitrocellulose membrane for 1 hour at 250mA, the membranes were blocked in 5% skim milk phosphate buffered saline at 4C for 4 hours. The membranes were washed three times for 10 minutes each in 0.1% Tween-20 in PBS after both primary and secondary antibody incubations. The pERK (42/44 kD), Gi (40kDa), Gq (40kDa) and PAR1 (55kDa) visualized with the polyclonal antibody raised against each in rabbit (1:5000 dilution from g/ml, Cell Signaling) and chemiluminescent detection of anti-rabbit IgG 1/200 conjugated with horseradish peroxidase (ECL, Amersham Corp). The expression of PARs differs for the types of vascular cells. Figure 1 shows PAR 1 and PAR3 expression on HUVECs and AoSMCs. The expression was evaluated consisted with prior work PAR1 and PAR3 express on AoSMC but PAR2 and PAR4 are not. The level of PAR1 expression is significantly greater on AoSMC (3:1) then HUVECs. We determine the PAR2 in vitro in HUVECs or AoSMCs, PAR2, does not respond to thrombin however according to reports, has function in inflammation. PAR4 is not detected in either cell types. However, PAR3 responding to thrombin at low concentration showed minute amount in AoSMC compare to weak presence in HUVECs. The origin of the thrombin may influence the difference in expression of PAR4 in HUVECs, since BIIa caused higher PAR4 expression than HIIA, but THIIa had almost none (not shown). The expression of the PARs, G proteins, and pERK use different signaling dynamics. The application of thrombin triggers the extracellular signaling mechanism through the PARs on the membrane; next, the signal travels through cytoplasm by Gi and Gq to MAPKs. Gi was activated more on AoSMC than HUVECs (Figure 2 and Figure 3). In Figure 2 demonstrates the expression of Gi on HUVEC starts at 20minutes and continues to be expressed until 5.5h time interval, but Gq/11 expression is almost same between non-stimulated and stimulated samples from 20min to 5.5 h period. The difference of expression between the two kinds of G proteins is subtle, Gi is at least five fold more than Gi expression on AoSMC. In Figure 3, there is a difference between Gi and Gq/11 expression on HUVEC. The linear increase from 0 to 30 minutes was detected, at 1hour the expression decreased by 50%, then the expression became un-detectable. Both Gi and Gq/11 showed the same pattern of expression but only Gi had again showed five times stronger signal than Gq/11. This brings the possibility that Gi had been activated due to thrombin and this signal pass onto AoSMC and remain there long period of time. Next, the proliferation through MAPK signaling had been tested by ERK activation. Figure 4 represents this activation data that both HUVECs and AoSMCs express activated ERK, but the activity dynamics is different as expected from G protein signaling pattern. Both AoSMC and HUVECs starts to express the activated ERK around 20min time and reach to the plato at 3.5hr. AoSMCs get phosphorylated at least 5 times more than HUVECs. This might be related to dynamics of each PARs as it had been suggested previously (by Coughlin group PAR1 vs. PAR4). Activation of DNA synthesis in AoSMCs. As it had been shown the serine proteases, thrombin and trypsin are among many factors that malignant cells secrete into the extracellular space to mediate metastatic processes such as cellular invasion, extracellular matrix degradation, angiogenesis, and tissue remodeling. We want to examine whether the types of thrombin had any specificity on proliferation on either cell types. Moreover, if there was a correlation between the number of cells and origin of thrombin, it can be use as reference to predict the response from the patient that may be valuable in patient’s recovery. As a result, we had investigated the proliferation of HUVECs and AoSMCs by WST-1 and BrDu. DNA synthesis experiments for HUVECs with WST-1and BrDu showed no mitogenic response to thrombins we used with WST-1 or BrDu. All together, in our data showed that there is no significant proliferation in HUVECs due to thrombins we used (data not shown). DNA synthesis for AoSMCs With WST-1: After the starvation of the cells hours by depleting the cells were treated with WST-1 and readings were collected at time intervals of 0, 3.5, 25, and 45hours. The measured WST-1 reaction increased 20% between each time points from 0 to 25 h and stop at 45 h except THIIa continue 20% increase (not shown). DNA synthesis at AoSMCs With BrDu: We had observed 2.5 fold increase of DNA synthesis of AoSMC after 72 hr in response to thrombin treatments, that resulted in cell proliferation according to Figure 5. The plates were seeded with 500 cells and the proliferation was measured at time intervals 3h, 24h, and 72h. At 3h time interval no difference between non-stimulated and stimulated by topical bovine thrombin AoSMC. At 24h the cells proliferate 20% by favor of treated cells, finally at 72h the ectopical bovine thrombin cause 253% more cell proliferationthan baseline. On the same token, TBIIa had 100% more mitogenic than THIIa but there was almost no difference between the HIIa and BIIa on proliferation (not shown). This predicts that as well as the origin of the product the purity of the preparation is important. The effects of thrombins on the transcription factors. Figure 7 demonstrates the comparison between HUVECs and AoSMC after topical bovine thrombin (JMI) stimulation to detect a difference on transcription activation. First, Figure 7A shows in HUVECs topical bovine thrombin causes elevation of ATF2 activation by 50% and c-Rel by 30%. Figure 7B represents in AoSMC thrombin affects CREB specifically since no change on HUVECs. As a result, the transcription factors are activated differently, therefore, CREB 40%, ATF2 80%, and c-Rel 10% elevated by TBII treatment compare to baseline. Gene Interaction changes after the thrombin treatment both in vivo and in vitro: Figure 8 shows RT-PCR for two of the cysteine rich family proteins in vitro (this study) as well as in vivo (Sag et al manuscript 2006). These genes have a predicted function in angiogenesis, connective tissue growth factor (CTGF) and cystein rich protein 61 (Cyr61). In our in vivo study, CTGF was only expressed if the veins are treated with thrombin and Cys61 expression is also elevated but both controls and bovine thrombin treated veins showed expression. The total RNA from the cells was purified and testes against controls, the negative controls by water or by no reverse transcriptase and positive controls by internal gene, expression of beta actin. The expression of beta actin is at least two-three times abundant in HUVECs than that of AoSMC. The CTGF is higher in AoSMCs than HUVEC. Simply the fact that the concentration of RNA is lower along with low internal expression positive control gene, but the CTGF expression was even 1 fold higher than HUVEC. In perfect picture this theoretically adds up to 4 times difference between the cell types in favor of AoSMCs. However, the Cyr61 expression adds up to the equal level of cDNA expression. Consequently, the overall use of topical thrombins changed the fate of the cells plus when they were in their very fragile state under the surgical trauma and inflammation caused by the operation. As a result, the cells may not be able make cohesive decision to avoid these extra signals, depending on the age and types of operations but eventually they lead to complications. In this study, we had shown the molecular pathway(s) affected by using ectopic thrombin during/after surgery on pig animal model that causing differentiation in the gene interactions for proliferation. In our study the mechanism for ectopic thrombins to investigate whether there was a difference in cell stimulation and gene interactions. Starting from the cell surface to the nucleus we had tested the mechanisms for thrombin affect on cells. We had found that there were differences between endothelial cells and smooth muscle cell responses depending on the type of thrombin origin. For example, PAR1 expressed heavily on HUVECs, but PAR1 and PAR3 on the AoSMCs. Activated PARs couples to signaling cascades affect cell shape, secretion, integrin activation, metabolic responses, transcriptional responses and cell motility. Moreover, according to the literature these diverse functions differ depending on the cell type and time that adds another dimension. Presence of PARs on different cell types have been studied by many groups for different reasons development, coagulation, inflammation and immune response. For example, PAR1 is the predominant thrombin receptor expressed in HUVECs and cleavage of PAR1 is required for EC responses to thrombin. As a result, PAR2 may activate PAR1 for action in addition to transactivation between PAR3 and PAR4 observed. PAR4 is not expressed on HUVEC; and transactivation of PAR2 by cleaved PAR1 can contribute to endothelial cell responses to thrombin, particularly when signaling through PAR1 is blocked. Next, the measurement of G protein expression shows that Gi and Gq have function at both cell types in terms of ectopical response to cAMP; therefore, Gi was heavily expressed. However Gi was stated to be function in development and growth therefore activates MAPKs most. As it was expected from previous studies and our hands in vivo, observation of elevated ERK phosphorylation in vitro at time intervals relay us to determine simply what molecular genetics and development players cause the thickening in the vessel. Analysis between the cell types resulted in proliferation of AoSMC, which was enough to occlude a vessel. The ability of the immune system to distinguish between benignand harmful antigens is central to maintaining the overall healthof an organism. Fields and Shoenecker (2003) from our lab showed that proteases, namely those that can activate the PAR-2 transmembraneprotein, can up-regulate costimulatory molecules on DC and initiatean immune response (45). Once activated, PAR-2 initiates a numberof intracellular events, including G and Gß signaling. Here, we show the PAR protein expression for PAR1 and PAR3 but not for PAR2. Yet we had seen mRNA expression of PAR2 in vitro. We had also detected Gi and Gq but no expression of Ga or Gbg. However, we did detect the difference of transcription factor activation by EMSA that correlates well with danger signal creation by thrombin. In this report with the highlights of our data it seems that it is possibly an indirect response. The bovine thrombin also affected the gene activation, measured by EMSA ELISA by direct treatment of the cells with thrombin response activation peptides (TRAPs) for PAR1, PAR2, PAR3, PAR4 on HUVECs since the endothelial cells directly exposed to ectopical thrombin treatment on vascular system and smooth muscle cells are inside of the vein. Therefore, plausibly ECs transfer the signals received from their surface to the smooth muscle cells. Second, we applied ectopical thrombins on AoSMCs as well as HUVECs by the same technique for the analysis of change same transcription factors previously with HUVEC for response to TRAPs. These factors were ATF-2, CREB, c-rel, NFkB p50, NFkB p65, and c-fos. In HUVECs, NFkB 50 increased the most by PAR2 oligo and PAR4 oligo, CREB as inflammatory response by PAR1 oligo, and ATF2 for PAR3 and PAR4 oligos, and c-fos with PAR4 oligo The cellular response for thrombin in AoSMC differs from HUVEC since the at AoSMC not only proliferation by CREB but also T cell activation by ATF-2 observed. CREB (CRE-binding protein, Cyclic AMP Responsive DNA Binding Protein) protein has been shown to function as calcium regulated transcription factor as well as a substrate for depolarization-activated calcium calmodulin-dependent protein kinases II and I. Some growth control genes, such as FOS have CRE, in their transcriptional regulatory region and their expression is induced by increase in the intracellular cAMP levels. This data goes very well with our finding of highly elevated Gi expression compare to Gq/11. The CREB, or ATF (activating transcription factor, CRBP1, cAMP response element-binding protein 2, formerly; (CREB2) are also interacting with p300/CBP. Transcriptional activation of CREB is controlled through phosphorylation at Ser133 by p90Rsk and the p44/42 MAP kinase (pERK, phosphorylated ERK). The transcriptional activity of the proto-oncogene c-Fos has been implicated in cell growth, differentiation, and development. Like CREB, c-Fos is regulated by p90Rsk. NFKB has been detected in numerous cell types that express cytokines, chemokines, growth factors, cell adhesion molecules, and some acute phase proteins in health and in various disease states. In sum, our data is coherent from cellular membrane to nucleus as well as from nucleus to cellular membrane. The origin of the thrombin is proven to be important, and required to be used very defined and clear concentrations. It is not an old dog trick since ectopical thrombins have been used to control bleeding very widely without much required regulations not only in the surgeries but also in many other common applications. In our experiments we observe MAPKs activities showed that pERK is active in AoSMCs more than HUVECs. The underlying mechanism how MAPKs connects to the cell cycle agree with our data that the mitogen-dependent induction of cyclin D1 expression, one of the earliest cell cycle-related events to occur during the G0/G1 to S-phase transition, is a potential target of MAPK regulation. Activation of this signaling pathway by thrombin cause similar affects as expression of a constitutively active MKK1 mutant (46) does which results in dramatically increased cyclin D1 promoter activity and cyclin D1 protein expression. In marked contrast, the p38 (MAPK) cascade showed an opposite effect on the regulation of cyclin D1 expression, which means that using unconcerned use of ectopic bovine thrombin will lead to more catastrophic affects then it was thought. Since the p38 also is responsible for immune response mechanism, the system will be alarmed by the danger signal created by bovine thrombin. The minute amount of well balanced mechanism will start against itself as it was observed previously (39-43, 47). Finally, according to the lead from the literature tested the cysteine rich gene expression of CTGF and Cyr61 showing elevation of CTGF in AoSMCs also make our argument stronger that the use of bovine thrombin does affect the cells beyond the proliferation but as system. All together, both in vivo and in vitro studies confirms that choosing the right kind of ectopic product for the proper “hemostasis” to be resumed at an unexpected situation in the operation room is critical, therefore, this decision should require careful considiration to avoid long term health problems. 1. Kalafatis, M., Egan, J. O., van ‘t Veer, C., Cawthern, K. M., and Mann, K. G. The regulation of clotting factors. Crit Rev Eukaryot Gene Expr. 7: 241-280, 1997. 2. Mann, K. G., Brummel-Ziedins, K., Orfeo, T., and Butenas, S. Models of blood coagulation. Blood Cells Mol Dis, 2006. 3. Mann, K. G., Butenas, S., and Brummel, K. The dynamics of thrombin formation. Arterioscler Thromb Vasc Biol. 23: 17-25, 2003. 4. Brummel, K. E., Butenas, S., and Mann, K. G. An integrated study of fibrinogen during blood coagulation. J Biol Chem. 274: 22862-22870, 1999. 5. Kalafatis, M., Swords, N. A., Rand, M. D., and Mann, K. G. Membrane-dependent reactions in blood coagulation: role of the vitamin K-dependent enzyme complexes. Biochim Biophys Acta. 1227: 113-129, 1994. 6. Lawson, J. H., and Mann, K. G. Cooperative activation of human factor IX by the human extrinsic pathway of blood coagulation. J Biol Chem. 266: 11317-11327, 1991. 7. Mann, K. G., Nesheim, M. E., Church, W. R., Haley, P., and Krishnaswamy, S. Surface-dependent reactions of the vitamin K-dependent enzyme complexes. Blood. 76: 1-16, 1990. 8. Hanisch, U. K., van Rossum, D., Xie, Y., Gast, K., Misselwitz, R., Auriola, S., Goldsteins, G., Koistinaho, J., Kettenmann, H., and Moller, T. The microglia-activating potential of thrombin: the protease is not involved in the induction of proinflammatory cytokines and chemokines. J Biol Chem. 279: 51880-51887, 2004. 9. Zakharov, S. I., Smani, T., Dobrydneva, Y., Monje, F., Fichandler, C., Blackmore, P. F., and Bolotina, V. M. Diethylstilbestrol is a potent inhibitor of store-operated channels and capacitative Ca(2+) influx. Mol Pharmacol. 66: 702-707, 2004. 10. Park, S. M., Jung, H. Y., Kim, H. O., Rhim, H., Paik, S. R., Chung, K. C., Park, J. H., and Kim, J. Evidence that alpha-synuclein functions as a negative regulator of Ca(++)-dependent alpha-granule release from human platelets. Blood. 100: 2506-2514, 2002. 11. Naldini, A., Carney, D. H., Pucci, A., and Carraro, F. Human alpha-thrombin stimulates proliferation of interferon-gamma differentiated, growth-arrested U937 cells, overcoming differentiation-related changes in expression of p21CIP1/WAF1 and cyclin D1. J Cell Physiol. 191: 290-297, 2002. 12. Xi, G., Keep, R. F., Hua, Y., and Hoff, J. T. Thrombin preconditioning, heat shock proteins and thrombin-induced brain edema. Acta Neurochir Suppl. 76: 511-515, 2000. 13. Ballermann, B. J., and Marsden, P. A. Endothelium-derived vasoactive mediators and renal glomerular function. Clin Invest Med. 14: 508-517, 1991. 14. Coughlin, S. R. Protease-activated receptors in hemostasis, thrombosis and vascular biology. J Thromb Haemost. 3: 1800-1814, 2005. 15. Blaukat, A., Barac, A., Cross, M. J., Offermanns, S., and Dikic, I. G protein-coupled receptor-mediated mitogen-activated protein kinase activation through cooperation of Galpha(q) and Galpha(i) signals. Mol Cell Biol. 20: 6837-6848, 2000. 16. Grand, R. J., Turnell, A. S., and Grabham, P. W. Cellular consequences of thrombin-receptor activation. Biochem J. 313 ( Pt 2): 353-368, 1996. 17. Hagemann, C., and Blank, J. L. The ups and downs of MEK kinase interactions. Cell Signal. 13: 863-875, 2001. 18. Fager, G. Thrombin and proliferation of vascular smooth muscle cells. Circ Res. 77: 645-650, 1995. 19. Gospodarowicz, D., Brown, K. D., Birdwell, C. R., and Zetter, B. R. Control of proliferation of human vascular endothelial cells. Characterization of the response of human umbilical vein endothelial cells to fibroblast growth factor, epidermal growth factor, and thrombin. J Cell Biol. 77: 774-788, 1978. 20. Kanthou, C., Kanse, S. M., Kakkar, V. V., and Benzakour, O. Involvement of pertussis toxin-sensitive and -insensitive G proteins in alpha-thrombin signalling on cultured human vascular smooth muscle cells. Cell Signal. 8: 59-66, 1996. 21. Kanthou, C., Kanse, S. M., Newman, P., Kakkar, V. V., and Benzakour, O. Variability in the proliferative responsiveness of cultured human vascular smooth muscle cells to alpha-thrombin. Blood Coagul Fibrinolysis. 6: 753-760, 1995. 22. Maragoudakis, M. E., Tsopanoglou, N. E., and Andriopoulou, P. Mechanism of thrombin-induced angiogenesis. Biochem Soc Trans. 30: 173-177, 2002. 23. McNamara, C. A., Sarembock, I. J., Bachhuber, B. G., Stouffer, G. A., Ragosta, M., Barry, W., Gimple, L. W., Powers, E. R., and Owens, G. K. Thrombin and vascular smooth muscle cell proliferation: implications for atherosclerosis and restenosis. Semin Thromb Hemost. 22: 139-144, 1996. 24. Tsopanoglou, N. E., and Maragoudakis, M. E. Role of thrombin in angiogenesis and tumor progression. Semin Thromb Hemost. 30: 63-69, 2004. 25. Lau, L. F., and Lam, S. C. The CCN family of angiogenic regulators: the integrin connection. Exp Cell Res. 248: 44-57, 1999. 26. Fimia, G. M., De Cesare, D., and Sassone-Corsi, P. Mechanisms of activation by CREB and CREM: phosphorylation, CBP, and a novel coactivator, ACT. Cold Spring Harb Symp Quant Biol. 63: 631-642, 1998. 27. De Cesare, D., and Sassone-Corsi, P. Transcriptional regulation by cyclic AMP-responsive factors. Prog Nucleic Acid Res Mol Biol. 64: 343-369, 2000. 28. De Cesare, D., Fimia, G. M., and Sassone-Corsi, P. CREM, a master-switch of the transcriptional cascade in male germ cells. J Endocrinol Invest. 23: 592-596, 2000. 29. De Cesare, D., Fimia, G. M., and Sassone-Corsi, P. Signaling routes to CREM and CREB: plasticity in transcriptional activation. Trends Biochem Sci. 24: 281-285, 1999. 30. Bonovich, M., Olive, M., Reed, E., O’Connell, B., and Vinson, C. Adenoviral delivery of A-FOS, an AP-1 dominant negative, selectively inhibits drug resistance in two human cancer cell lines. Cancer Gene Ther. 9: 62-70, 2002. 31. Mo, F. E., Muntean, A. G., Chen, C. C., Stolz, D. B., Watkins, S. C., and Lau, L. F. CYR61 (CCN1) is essential for placental development and vascular integrity. Mol Cell Biol. 22: 8709-8720, 2002. 32. O’Brien, T. P., Yang, G. P., Sanders, L., and Lau, L. F. Expression of cyr61, a growth factor-inducible immediate-early gene. Mol Cell Biol. 10: 3569-3577, 1990. 33. Sampath, D., Winneker, R. C., and Zhang, Z. Cyr61, a member of the CCN family, is required for MCF-7 cell proliferation: regulation by 17beta-estradiol and overexpression in human breast cancer. Endocrinology. 142: 2540-2548, 2001. 34. Pendurthi, U. R., Allen, K. E., Ezban, M., and Rao, L. V. Factor VIIa and thrombin induce the expression of Cyr61 and connective tissue growth factor, extracellular matrix signaling proteins that could act as possible downstream mediators in factor VIIa x tissue factor-induced signal transduction. J Biol Chem. 275: 14632-14641, 2000. 35. Chen, C. C., Chen, N., and Lau, L. F. The angiogenic factors Cyr61 and connective tissue growth factor induce adhesive signaling in primary human skin fibroblasts. J Biol Chem. 276: 10443-10452, 2001. 36. Liu, B., Yu, J., Taylor, L., Zhou, X., and Polgar, P. Microarray and phosphokinase screenings leading to studies on ERK and JNK regulation of connective tissue growth factor expression by angiotensin II 1a and bradykinin B2 receptors in Rat1 fibroblasts. J Cell Biochem. 97: 1104-1120, 2006. 37. Bode, W., Turk, D., and Karshikov, A. The refined 1.9-A X-ray crystal structure of D-Phe-Pro-Arg chloromethylketone-inhibited human alpha-thrombin: structure analysis, overall structure, electrostatic properties, detailed active-site geometry, and structure-function relationships. Protein Sci. 1: 426-471, 1992. 38. Bode, W., Turk, D., and Sturzebecher, J. Geometry of binding of the benzamidine- and arginine-based inhibitors N alpha-(2-naphthyl-sulphonyl-glycyl)-DL-p-amidinophenylalanyl-pipe ridine (NAPAP) and (2R,4R)-4-methyl-1-[N alpha-(3-methyl-1,2,3,4-tetrahydro-8- quinolinesulphonyl)-L-arginyl]-2-piperidine carboxylic acid (MQPA) to human alpha-thrombin. X-ray crystallographic determination of the NAPAP-trypsin complex and modeling of NAPAP-thrombin and MQPA-thrombin. Eur J Biochem. 193: 175-182, 1990. 39. Lawson, J. H., Lynn, K. A., Vanmatre, R. M., Domzalski, T., Klemp, K. F., Ortel, T. L., Niklason, L. E., and Parker, W. Antihuman factor V antibodies after use of relatively pure bovine thrombin. Ann Thorac Surg. 79: 1037-1038, 2005. 40. Lawson, J. H., and Murphy, M. P. Challenges for providing effective hemostasis in surgery and trauma. Semin Hematol. 41: 55-64, 2004. 41. Schoenecker, J. G., Johnson, R. K., Lesher, A. P., Day, J. D., Love, S. D., Hoffman, M. R., Ortel, T. L., Parker, W., and Lawson, J. H. Exposure of mice to topical bovine thrombin induces systemic autoimmunity. Am J Pathol. 159: 1957-1969, 2001. 42. Su, Z., Izumi, T., Thames, E. H., Lawson, J. H., and Ortel, T. L. Antiphospholipid antibodies after surgical exposure to topical bovine thrombin. J Lab Clin Med. 139: 349-356, 2002. 43. Lawson, J. H., Pennell, B. J., Olson, J. D., and Mann, K. G. Isolation and characterization of an acquired antithrombin antibody. Blood. 76: 2249-2257, 1990. 44. Lundblad, R. L., Bradshaw, R. A., Gabriel, D., Ortel, T. L., Lawson, J., and Mann, K. G. A review of the therapeutic uses of thrombin. Thromb Haemost. 91: 851-860, 2004. 45. Fields, R. C., Schoenecker, J. G., Hart, J. P., Hoffman, M. R., Pizzo, S. V., and Lawson, J. H. Protease-activated receptor-2 signaling triggers dendritic cell development. Am J Pathol. 162: 1817-1822, 2003. 46. Lavoie, L., Roy, D., Ramlal, T., Dombrowski, L., Martin-Vasallo, P., Marette, A., Carpentier, J. L., and Klip, A. Insulin-induced translocation of Na+-K+-ATPase subunits to the plasma membrane is muscle fiber type specific. Am J Physiol. 270: C1421-1429, 1996. 47. O’Shea S, I., Lawson, J. H., Reddan, D., Murphy, M., and Ortel, T. L. Hypercoagulable states and antithrombotic strategies in recurrent vascular access site thrombosis. J Vasc Surg. 38: 541-548, 2003.